Spring is a time for new growth and even new beginnings, right? Well it's Spring and there's new growth shooting up in my life and in my days. Seriously, I've had some daffy days, and it's truly put me in a daze. I had my plans laid out from now through September. I knew what I needed to do, why I needed to do them, and how I was going to accomplish it. But it went up in smoke over the weekend. And so did my attitude. I gave both duct tape and my delete key a good work out, and I am sooooo thankful I did because God changed my attitude and things are okay. I've been saying for a long time that I want GOD'S timing for God's will in my life and this weekend the rubber met the road (as my dad is fond of saying). If I'm not able to get the missionary romance manuscript done before September, it's okay. God's timing is best. And when my attitude takes a turn for the worse, as it often does, I need to return to God's sovereignty and give Him control of my life and IN my life. It's a conscious choice I have to make, regardless of whether I want to or not. I truly love Spring. And I'm posting today at The Barn Door about Sure Signs of Spring. If you happen to go to church with me, or live around here, you'll recognize a picture or two at The Barn Door. ;-) I'd love for you to join me there. So tell me, do you have new growth in your life? How about something that was dormant blooming? One of the things of living where we do (in the middle of nowhere, LoL) is that we sometimes have... visitors. 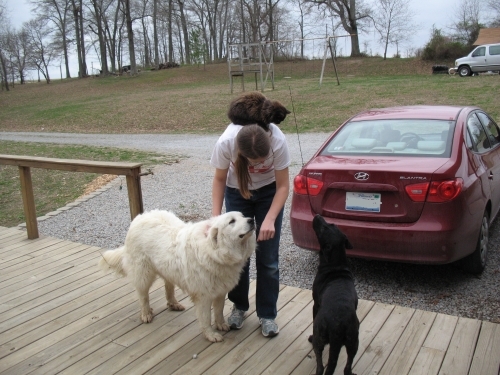 Four-footed visitors. Yesterday's was the friendly variety even though she's black with a white stripe. We were curious about what Gracie would think of another (strange) dog in her territory, but once she saw the pup wasn't a threat to her or my daughter, and she still got attention, she was fine. 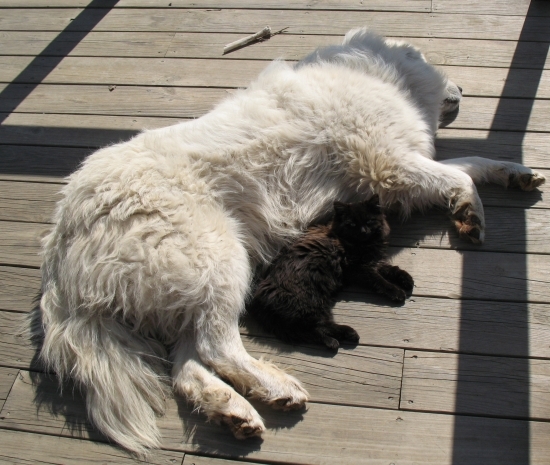 Now the cats took a little longer, but they're coming to terms with each other. Here's Esther with Gracie and the pup, and FlufferNut found a safe place to observe while she decided if it was safe or not. This is the latest I remember ever having snow. It stinks! LoL But at least it won't be here long! 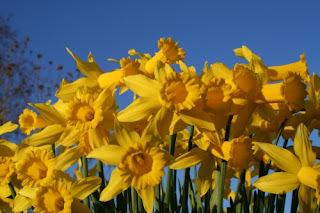 And ironies of ironies--I'm posting today at Jewels of Encouragement about Spring, and daffodils! (Can you tell I love daffs?) 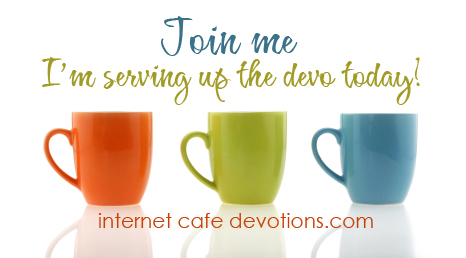 Won't you join me at Jewels of Encouragement today? I love spring. One of the things I love is seeing all the daffodils blooming in the middle of nowhere. They were planted generations ago by ladies who loved beauty, and those flowers are still there--still blooming each and every spring. Those ladies still have an impact on the world. 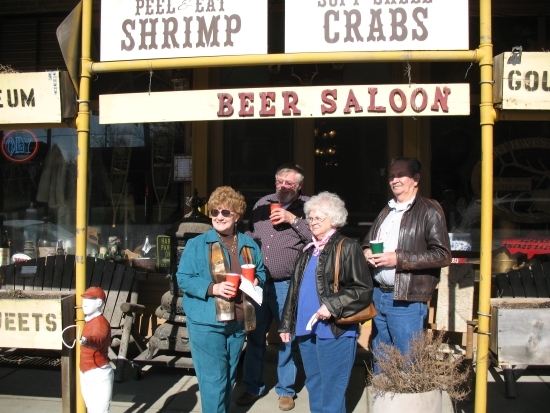 They're still making this a beautiful place to live, even though they're no longer here to enjoy it or even nurture it. That's what I want for my life. I want to leave lasting beauty for those coming after me. How do I do that? 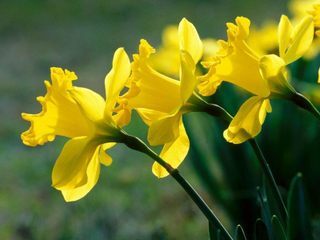 By planting flower bulbs? I could. But it only takes one pass of a tractor or bulldozer to bring their beauty to an end. 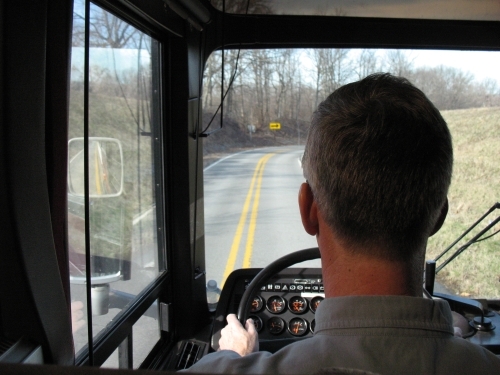 God has given each one of us work to do in our life, with our life. We need to fulfill that calling to the best of our ability. Whether we're in the task-force, ministry, or at home full-time, we're to be a light shining brightly to those around us. A flower that blooms in unlikely places, pointing others to Christ. Always pointing to Jesus. If we're obeying God, we're planting for eternity. Well, let me rephrase that. There are many times my husband asks me to do something, and I'll do it...eventually. I'll do it...grudgingly. I'll do it...muttering the whole time. I'll do it...with a rotten attitude. Sure, it's obedience, but... It's like if my husband were to pick a bouquet of flowers, and before giving it to me, squishing each bloom in his fist. It takes more than obedience to plant for eternity. Jesus said that unless a grain of wheat falls into the earth and dies, it won't bear fruit (John 12:24). In order for us to bear fruit for eternity, we need to deny ourselves and follow Jesus (Luke 9:23). Denying ourselves is when the seed dies. That's when planting for eternity starts. With a sweet aroma, not the smell of rottenness. That kind of life will produce results that bear fruit and bloom even after we're gone--just as those daffodils bloom long after their planters have died. We don't know the planters' names, but what's important is that they planted the flowers and we're still reaping the benefits and beauty of them. That's what we're looking for in our lives, too. The beauty of a life lived for Christ. Today I'm posting at the Cafe! It's one of my favorite sites--won't you join me there? I've had my hind quarters kicked and it's really got me moving. Sunday I was able to attend my first ever writers group meeting and it brought some things into focus for me. It's like the binoculars were pulled from my face, turned around and put back up to my eyes. You know when you look through the wrong end of binoculars, how everything looks so tiny and so much farther away than it really is? Well, I think that's what I've been doing. (Purposefully) Looking through the wrong end of my binoculars because I didn't want to face reality and accept that it was time to get hustling. It's something that I've been wrestling with for a couple of weeks and there was no escaping on Sunday. So, I'm hustling. I know what I need to do, by when, and why. Lots of reasons why. Are you intentionally looking through the wrong end of your binoculars so you don't have to make a decision or do something? It's time to turn them around and see things as they really are. Recently I've been researching missions in Ecuador, where I spent my teen years as a missionary kid. Although I've LOVED the research and all that I'm learning, it's not been easy. Maybe because missions is so near and dear to my heart—one of those things I hold close. I'm learning more about perseverance as I study missions in Ecuador. 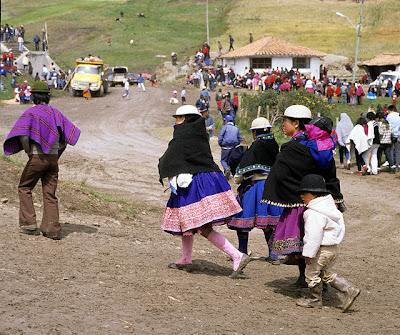 Did you know that missionaries worked with the Quichua people for 50 years before any were saved? (LoL—if you knew that, email me cuz I have a little gift for you. Really.) The Quichua New Testament had been translated and published by that time and slowly the people were saved and being baptized. I get frustrated when my kids don't listen and change their actions after only 5 minutes of me explaining why they should. I give up on people after maybe 5 months of feeling like I'm banging my head on the wall. Yet those missionaries worked and lived and loved the Quichuas for over 50 years before seeing eternal fruit for all the blood, sweat and tears they poured into those people. And yes, missionaries pour boatloads of blood, sweat and tears into the people they're living amongst. I've seen it in almost every missionary I know well enough. Those missionaries were willing to live and work for years and years without seeing fruit for their labor—simply because they were convinced they were where God wanted them, doing what God wanted them to do. If they had quit, there wouldn't be thousands of Quichua believers now. And I get impatient over the stupidest things. So many of my (writer) friends grow discouraged and quit when they don't see a contract in 5 years. So many of us throw in the towel when we don't see the progress we think we should, but where does persevering simply because it's where God wants us fit into the equation? Am I willing to do what God wants me to even if I don't see the progress or fruit I think I should? Even if it's 50 years? I think I need to change my perspective. My older kids are on Spring Break and I don't think this was part of their plans... But you know how plans go. 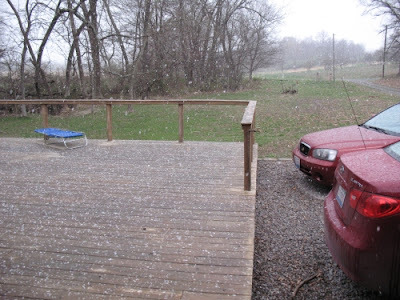 I had great plans to do a signs of spring post for today at The Barn Door, but the weather didn't co-operate and I got busy doing other things so, no signs of spring post today at The Barn Door. Instead I posted about Eyes in the Dark and being safe in Christ. Won't you join me? That's my oldest (in a retired firefighters' rig, courtesy of my brother-in-law) walking out to check the well. 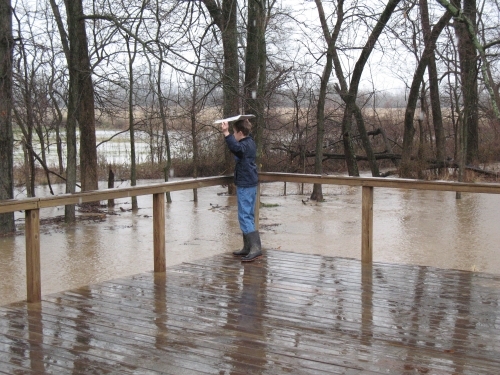 Each year the well gets flooded so we watch for it--which is an adventure for the boys because they have to check everything along the way, and beyond the well and... well, you know boys. 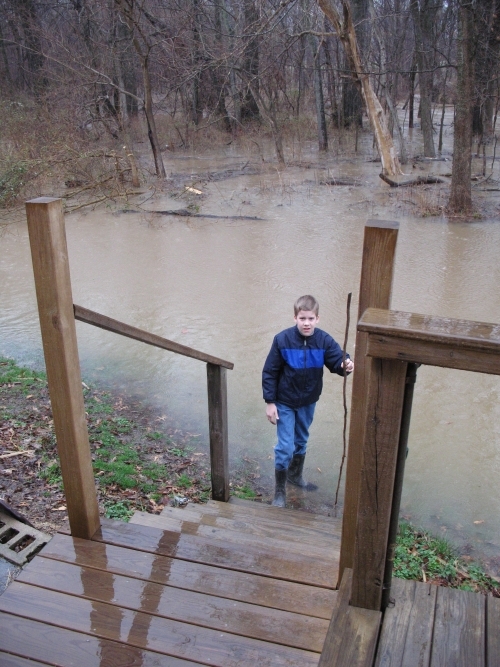 Our yard fills with water so it looks like our deck is lake front property. 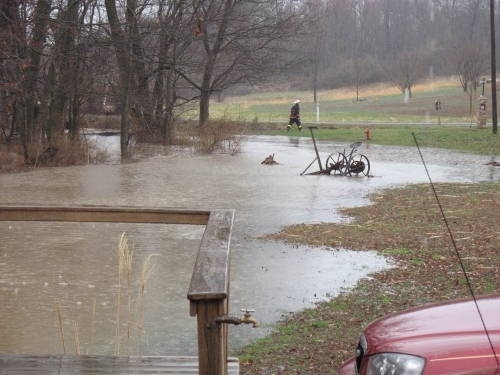 Sometimes it's a close call because our yard turns into a lake. The pasture next door fills and the corn field across from it looks like a rice paddy. So tell me, how's Spring where you are? So this morning, I sat down and loaded the Jewels blog... and immediately wanted to crawl under my desk and hide. Oh, the post itself was fine. But there was NO picture. None. Zippo. Nada. 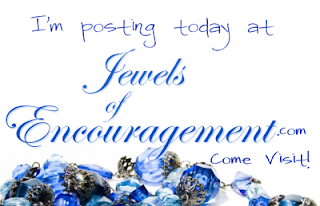 See, Jewels of Encouragement is a great group blog I (WE) set up last month, and as we invited people to join us, we had some guidelines and two of them were pictures and comments. No picture in my post (although there certainly is now *eye roll*) and I've been awol this week--not commenting as I buckled down and made tracks on a manuscript. I was so close to reaching the end of my tunnel that I tossed everything aside and made a mad dash for the finish line. I am finally, officially caught up. I'd be happy dancing if I hadn't dropped doing some of the things I tells others to do. But yanno, it reminds me of my spiritual life. There are plenty of times I do the very things I don't want to do, and do the things I don't want to. (Sound familiar? Paul said something like that in Romans 7:15) Times when I do in my spiritual life what I ended up doing at the Jewels blog this week and today. Life doesn't end over it. Thankfully. But it's at these times that I find I need to settle in, buckle up and get to work doing those things that I need to do. Last month held several surprises for me--all good ones! I'll tell you about the others next week, but today I want to show you my Senior for a day outing with the senior adults of my church. Our church has an abundance of twins and we had two sets on the bus with us. 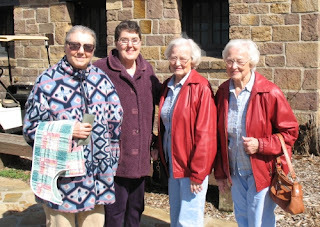 The sisters in the red jackets are the ladies that oversee the church clothing room where I normally work one morning a week. Normally. This semester my car is busy with a campus run so Esther and I aren't able to work there. I have to tell you, I really miss my time with all the ladies who work there! 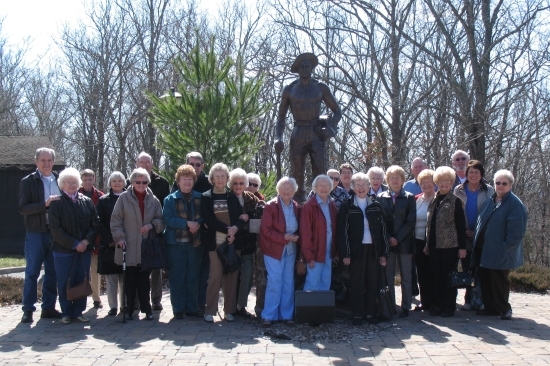 Many of them are in the group picture above, but I didn't get to visit with them on the outing. Maybe over Spring Break I'll be able to get in for the clothing room and get caught up with them. They're very important ladies to me. This is the BIG road. The road before the narrow, windy road which was just wide enough for the bus and there were a couple cars that came whizzing around a corner toward us and found a huge surprise: a tour bus taking up the road. LoL. I think it flustered them more than it did Jim who merely chuckled and watched them slide past. 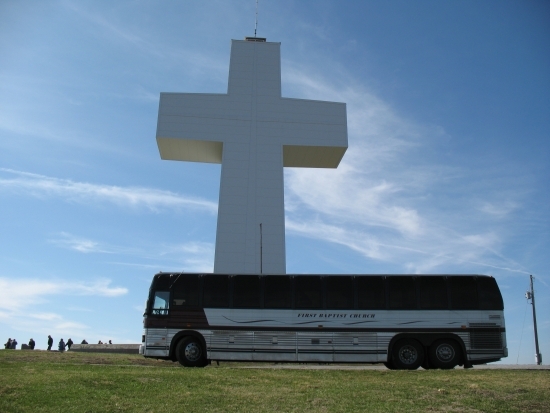 Here's the bus and Bald Knob Cross. 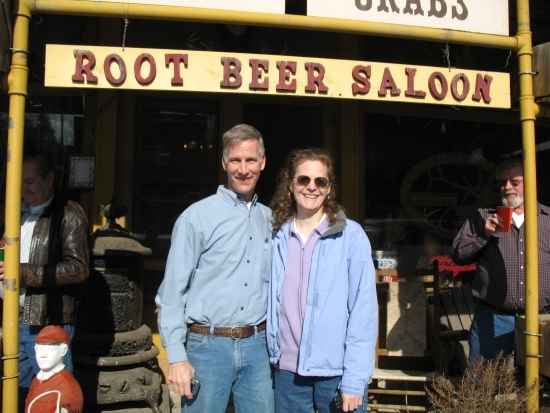 On our way home we stopped at Alto Pass in the Root Beer Saloon. On the sidewalk was a gigantic ant that we loved. 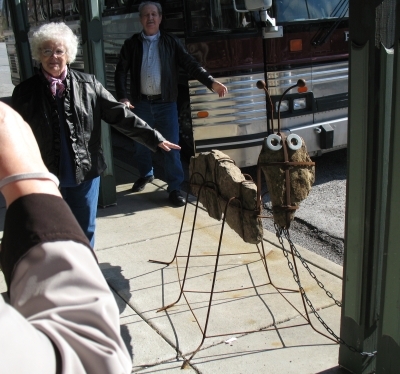 There were smaller versions in a storefront and the artist also made several other little critters that were cute. Have I ever mentioned that I love Photoshop? hehe. 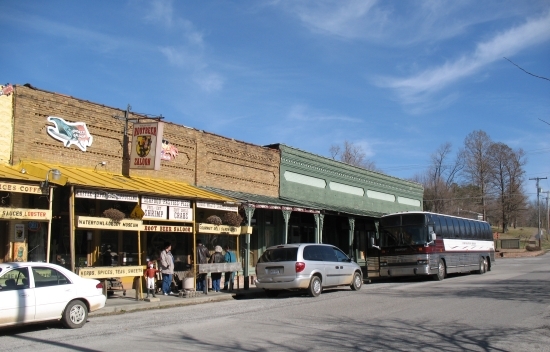 This store was INcredible! What a history lesson within four walls! Posted on the front door (naturally, a wooden screen door) was a sign that said no pictures without permission, so I put my camera away and just wandered through. The atmosphere was not 21st century at all! Their register was one of those huge ones--gorgeous--and there were potbellied stoves and so many other relics of an era gone by. I loved it. Here we are in Alto Pass. See the phone in my hand? The kids weren't with us. They were home alone. LoL. It's an extra special treat to get away for a day, but I'm so very thankful for today's technology that allowed me to keep tabs on what was going on at home. I was able to relax and totally enjoy my (senior-for-a)day. Thanks for inviting me along! You guys are GREAT! Yup, I'm in. Safe. (although I've not heard from them confirming receipt of my entry yet... so how safe I am is still debatable.) I wasn't planning on entering this year, for several reasons but time being one of them, but one of the blogs I keep up with, even if I don't comment (cuz it's a vortex over there for me!) is Seekerville. Tina Radcliffe is a drill sergeant (hey, did I spell that right? I caught myself spelling it Sargent. hehe. It IS the best way to spell Sargent, yanno!) So anyway, one day when I was procrastinating by visiting there, Tina posted about the Genesis and I was trapped. I just could not miss another year. Soooooooo, I crammed yet another thing into poor lil ol Februaray. Oh well. Maybe when I'm a woman of leisure and have a few bonbons to pop.